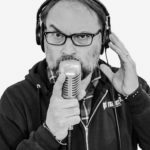 In this episode of Sound Design Live I speak with filmmaker and host of Roadie Free Radio, Larry Milburn. We discuss how to be a self-starter in the audio industry and the many career paths of a sound engineer. No one’s going to hand you a job in this industry. There is a large amount of self starting. One of the common threads that I’ve found with people is that they’ve all had a ferocious desire to learn. You gotta be nice to people. That’s the best promotion you can do.